Westwind takes the guesswork out of gouging reed cane and gives you the precision you need to pursue your perfect reed. Why buy the Westwind Gouger? Gouging reed cane has always been one of the most thankless tasks when making Oboe reeds. Traditional gougers are imprecise and difficult to adjust, making it time-consuming and risky to experiment with your gouge dimensions. Since a change in the gouge thickness also affects the sidewall dimensions, it is very difficult to experiment and then return to the original settings. To make matters worse, removing the blade affects all the settings, so sharpening the blade is avoided for a long as possible because the gouger then has to be “set up” again. In short, traditional gougers force us to work under less than optimal conditions. The Westwind Gouger is designed to overcome all of these challenges. Using state of the art machining techniques, the Westwind Gouger gives you unprecedented control. Available for Oboe, English Horn, or Oboe d’Amore, this is the first reed making tool that actually encourages you to fine-tune your measurements rather than penalizing you for experimenting with them! The Westwind Gouger is unlike any other gouger because it lets you adjust every aspect of your gouge independently, exactly, and repeatably. It begins by separating and isolating the four settings—gouge thickness, sidewall thickness, chip thickness, and blade location—so that each adjustment is completely unrelated to the other. The next step is to make each of them micro-adjustable so that each turn of the screw represents precisely one small unit of measurement. You can, for instance, use the sidewall adjustment to configure your gouger with a single or double radius. Placing on the center line of the cane gives you a single radius gouge, while placing it off the center line gives you a double radius gouge. With this tool, you’ll be able to measure the cane, decide what you want to do differently, make the adjustment, and try it. If you don’t like it, you can always return to your original settings with a simple turn of the screwdriver. After all, the mystery shouldn't be how to get the blade where you want it. The mystery is in knowing where you want to put it in the first place! The blade on the Westwind Gouger is made from the finest tool steel so you can gouge plenty of cane before re-sharpening it…but when the time comes, you’ll never have to compromise again. The blade mounting system allows the blade to be removed, sharpened, and replaced in less than 10 minutes. And since the blade location is independent of the other adjustment settings, you can return to gouging immediately without further setup. We all know how important it is to use a sharp reed knife. A dull edge makes the scrape rough rather than smooth, and a really dull edge can actually crush the fibers of the cane. Just like your reed knife, the blade on your Westwind Gouger can be sharpened when you see the first signs of dullness. And that means you’ll be gouging under optimal, rather than marginal conditions. If you play more than one instrument in the oboe family, buying gougers for each can put a big strain on your budget. That’s why the Westwind Gouger was designed with expansion in mind. You can start with any gouger configuration—Oboe, English Horn, or Oboe d’Amore—then reconfigure it easily with an optional expansion kit. Simply replace the interchangeable cane bed and blade assemblies to turn one gouger into another. The cane stop on the guillotine can be shifted to accommodate the different reed lengths as well. The entire replacement process takes less than 10 minutes, so you’ll be up and running in no time. There are two types of adjustment mechanisms used on the Westwind Gouger, super-fine and medium-fine. The super-fine mechanism handles the most critical adjustments: gouge thickness (depth of gouge) and sidewall thickness (off-centerline). The medium-fine mechanism controls the secondary adjustments: chip thickness and blade indexing. This chart explains the benefits in detail. The final gouge thickness used by oboists’ worldwide ranges from around .46mm to .94mm*. The Westwind super-fine adjustment mechanism covers this range in .02mm increments. Each increment is one full turn of the adjustment screw. * From Oboe Reed Styles: Theory and Practice by David A. Ledet Both the chip thickness and the blade indexing settings are practical adjustments and depend to some degree on the cane being gouged. The Westwind Gouger's medium fine adjustment mechanism has a resolution of .010 inches per turn of the adjusting screw, providing fine control while allowing travel through the greater range required by these two adjustments. The gouge thickness setting is different from traditional gougers in that the adjustment is no longer determined by changing the height of the swinging carriage. The cutting blade is mounted to a separate blade block which consists of the blade rear guide, and adjustable front guide. This blade block moves vertically and the final location of the blade is set while the carriage remains absolutely horizontal. This eliminates the possibility of sidewall change or asymmetrical gouge (cosign error) caused by the rotation of the carriage. The sidewall thickness setting lets you configure your gouger as either a single radius or a double radius machine. With traditional gougers, adjusting the blade from side to side in the carriage (in order to gouge off of the centerline) creates unbalanced cutting forces, often skewing or skating the cane in the bed of the gouger. By contrast, the Westwind Gouger fixes the blade to the centerline of the guides moving the whole assembly from side to side. This creates an even distribution of cutting forces and virtually eliminates the problem. Traditionally, the protrusion of the blade through the carriage has been the means to control chip thickness. Unfortunately, because the front guide rides on top of the cane about to be cut, the rear guide is suspended above the cane after the cut is made by the thickness of the chip removed. Since the function of the guide is to hold the cane into the bed of the gouger, if the rear guide is not pressing the cane into the bed, the cutting action of the blade can lift the cane up during gouging. Further, changing the chip thickness changes the final gouge thickness of the cane. The chip thickness adjustment on the Westwind Gouger is different because it is controlled by the front guide. 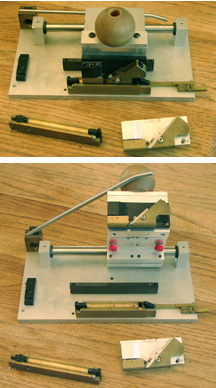 The front guide is assembled to the blade block with its own mechanism which raises or lowers it in front of the blade. This exposes more or less blade to the cane, varying the chip thickness without changing the final gouge thickness. The blade indexing mechanism on the Westwind Gouger bears a superficial resemblance to the chip thickness adjustment of the traditional gouger, but the resemblance is illusory. Unlike traditional gougers, where the blade adjustment serves to adjust the chip thickness (which incidentally changes the final gouge thickness) the cutting edge of the Westwind Gouger always remains in a fixed location. The blade is mounted on an indexing pin. This allows it to be removed and replaced in precisely the same location. As repeated sharpening of the blade shortens it, the blade adjustment mechanism is used to move the indexing pin slightly, putting the cutting edge back in its original location.